By Kjell Aleklett - posted Tuesday, 5 June 2007 Sign Up for free e-mail updates! The issues of climate and future temperature increases have become part of our everyday life, and central in this debate is carbon dioxide. The fossil fuels we use contain carbon and hydrocarbon compounds, and carbon dioxide is released together with energy when we burn these. However, it seems that the amounts of fossil fuels themselves are not perceived as a problem among those debating climate change. Instead, the problem is only ever that we are expected to use too much of them. The idea that the combined volumes of these fuels are insufficient to cause the changes in climate that are currently discussed is nowhere to be heard. At Mexico’s enormous oilfield named Cantarell, production is declining very rapidly. In 2005 the Mexican oil company Pemex presented two scenarios for how much oil Cantarell would ultimately produce: an optimistic estimate where they could extract 50 per cent of the oil originally in place in the oilfield; and a pessimistic estimate of only 30 per cent. For the national oil company Pemex and for Mexico it is, of course, a severe blow that the reality now appears to be consistent with the more pessimistic scenario: but, having said that, our climate stands to benefit. We have now come to an important decision-making point. Shall we regard the oil that remains underground as a resource that can cause future carbon dioxide emissions or shall we accept that it is, in fact, inaccessible? The UN’s climate panel IPCC, that recently published its fourth report on climate change, regards the oil left in ground as a resource. 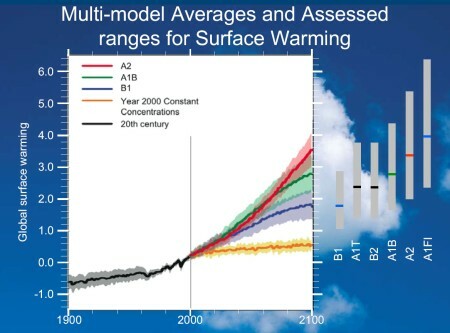 Figure 1: Average temperatures and temperature ranges predicted in different IPCC scenario families. The worst case scenario in terms of future temperature increase is for family A2. If their scenario is realised the temperature by 2100 will be a whole 3.6C higher than today. The least troublesome family is B1: they can expect a temperature increase of 1.8C. First published in Dagens Nyheter, Sweden. Kjell Aleklett is a Professor in Physics, Uppsala Hydrocarbon Depletion Study Group, at Uppsala University, Uppsala, Sweden.